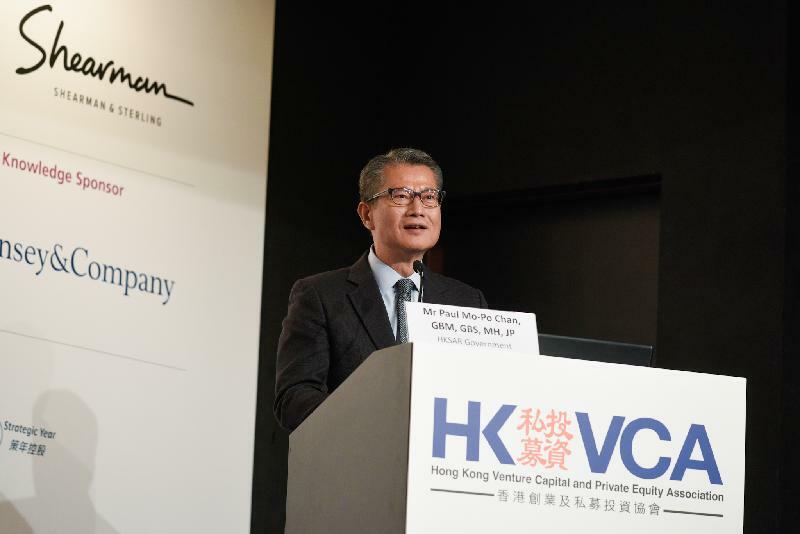 It's a great pleasure to be here, once again, for the Hong Kong Venture Capital and Private Equity Association's Annual Forum. It is a reminder that another year has passed, and a New Year replete with opportunities and boundless promise awaits. Going hand in hand with the multiple opportunities are of course challenges – the known, the unknown and, to quote Mr Rumsfeld, the "unknown unknowns." No doubt, you'll be discussing all of that, and a good deal more, through the course of this invaluable international Forum here in Hong Kong, where the world meets. "Unknown unknowns," for sure are issues which we cannot predict in advance. So allow me, for the next few minutes, to be down to earth, to focus on what we do know, what we have accomplished, and what we plan to achieve for our finance industry and for Hong Kong. No less important, it showcases the Government's commitment to making Hong Kong a multi-dimensional fund centre. And I'm confident it will create more opportunities for our fund and related businesses. Last month, the bill extending profits tax exemption to onshore funds, in addition to offshore funds, was introduced in the Legislative Council. Under this bill, private equity funds are among those that will enjoy profits tax exemption. A tax-exempt fund can invest in local and overseas private companies. I'm hopeful that the new tax treatment will take effect very soon. Last April, we rolled out a new listing regime for pre-revenue, or pre-profit, biotech companies and companies with a weighted voting rights structure. To date, 7 have been listed on the Stock Exchange of Hong Kong under the new regime, and many are in the pipeline. Good news, too, on the IPOs (Initial Public Offerings) front. Last year, Hong Kong raised about HK$287 billion through IPOs, claiming the global IPO crown. Indeed, Hong Kong has ranked first globally 6 times in the past 10 years. And then there's Hong Kong's role as one of the world's leading international financial centres. You can see that, at work brilliantly, during this International Financial Week here, which began with the impressive two-day Asian Financial Forum concluded only yesterday. Today's Forum is another highlight, as is tomorrow's EMPEA Private Equity Masterclass, organised by the HKVCA. Numbers also underline Hong Kong's status as a financial services powerhouse. We rank third in the Global Financial Centres Index, behind only London and New York. We topped the Milken Institute's Global Opportunity Index in 2017. And for the past 24 years in a row, the Washington-based Heritage Foundation has named Hong Kong the world's freest economy. Add it up, and you have a financial foundation as formidable and deeply rooted as anywhere in the world. And I have no doubt that economic growth and accelerating wealth creation in this part of the world, particularly the Mainland of China, will continue to support Hong Kong's asset and wealth management business. At the end of 2017, assets under management in Hong Kong totaled some US$3.1 trillion. Non-Hong Kong investors accounted for two-thirds of this. Private equity is critical to our asset and wealth management landscape. We are Asia's second-largest private equity centre, trailing only the Mainland. As of mid-2018, our private equity players managed US$152 billion in Hong Kong. That's about 16 per cent of the total capital under management in Asia. During the first half of 2018, private equity funds raised in Hong Kong amounted to US$12 billion, about 20 per cent of the total funds raised in Asia. Given investors interest in diversified portfolios – both in asset class and geographical exposure – Hong Kong can only continue to capture business opportunities in the Asian private equity market. The Financial Services and the Treasury Bureau is working closely with the Hong Kong Monetary Authority and the Securities and Futures Commission on the proposal. Our objective is to have a regime catering for the needs of private equity funds, while safeguarding investor protection. The Government will continue to boost Hong Kong's unique role as gateway between international markets and investors and their counterparts on the Mainland of China. We'll do so through the Stock Connects, Bond Connect, and the Mutual Recognition of Funds arrangements. We will also further strengthen our position as the global offshore RMB business hub. Turning to the Belt and Road Initiative, Hong Kong's financial services industry is well positioned to contribute in a number of areas. Given our liquid capital flow and deep pool of financial talent, Hong Kong is the natural centre from which to raise funds for infrastructure, investment and production projects. Green finance is also promising. And I am pleased to report that the Government will soon launch its green issuance under the Government Green Bond Programme, which has a borrowing ceiling of HK$100 billion. Ladies and gentlemen, the above highlight some of our ambitious plans for this New Year and beyond for our financial services in general, and for the asset and wealth management sector in particular. Of course, global trade friction and macro-economic concerns are visible impediments and then there are those "unknown unknowns". Still, Hong Kong has always risen to the challenge. And with your continuing support and considered suggestions, we'll continue to create opportunities for you, and for all of Hong Kong. I wish you all a rewarding Forum and a healthy and prosperous 2019.